Hi everyone. 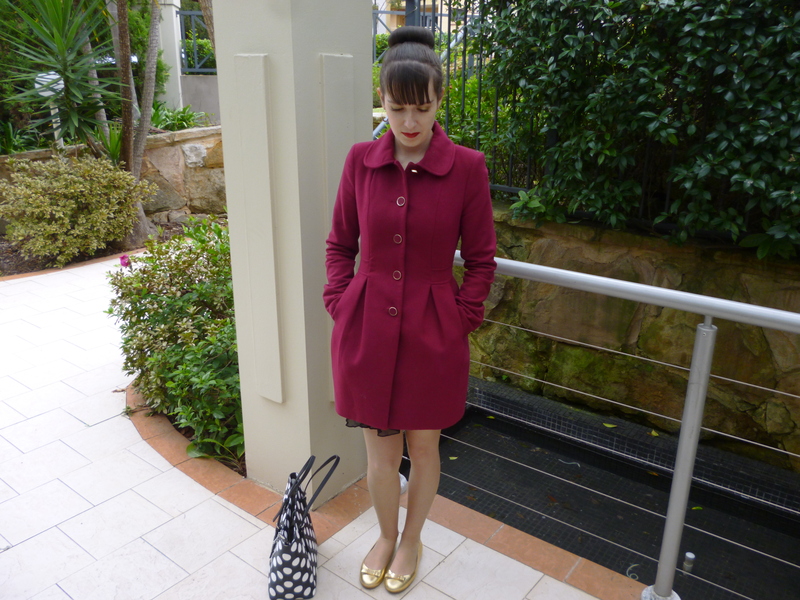 As you can see I could not resist purchasing the beautiful mulberry coloured coat from my last post. I love this beautiful shade so much and I’ve never had anything quite like it before. It’s a little darker than my usual shade but I’m really enjoying pretty jewel tones at the moment. It’s the same coat I have in pale blue which I received for my birthday so now I have the same coat in more than one colour; that’s testament to how much I adore my birthday gift. I also like the design with the shorter length and bold buttons. I know I’ll be getting so much use from these coats, I certainly have already. The flower hair clip is my favourite hair piece at the moment. I love the design and it’s also easy to use since the flowers are attached to a hair comb. I’m think of attaching many of my existing hair flowers to hair combs or making my own because it is much more convenient than the clips usually sold in the shops. 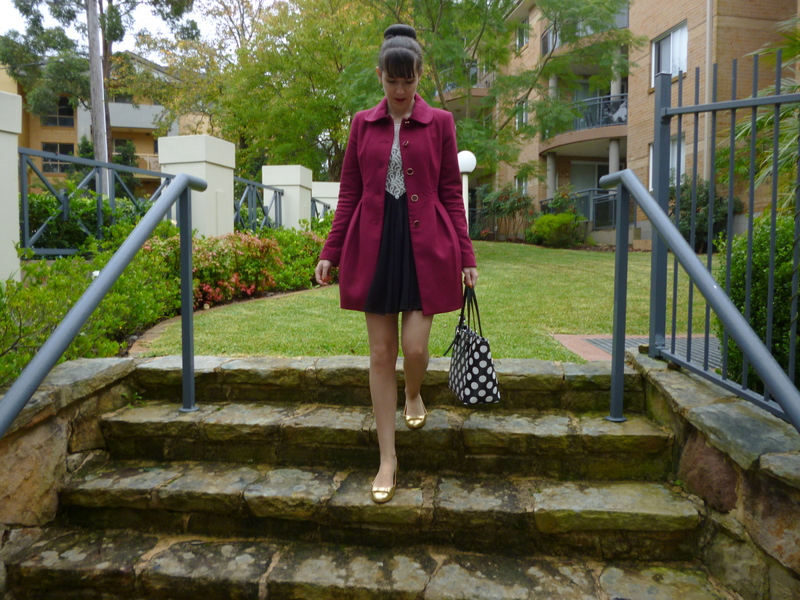 I thought the golden flats would add a touch of colour and sparkle to the outfit. These are one of a few pairs of Marc by Marc Jacobs flats which I own. They are the most comfortable shoes ever and I love how brightness of the gold. I also like having a pair of the logo flats in addition to the mouse flats. Tomorrow my husband will be leaving for a two and a half week family trip overseas. The main reason I’m not coming is because, in addition to it being difficult to get the time off work, I cannot get on a plane. I struggle with a lot of forms of transport including planes, buses on motor ways and express trains. There is just no way I could spend multiple hours on a plane. I haven’t been on a plane for five years and even then I have only traveled on 1.5 hour flights but these days I wouldn’t even do that. I feel sad that I’m missing out on yet another experience that the family will have together. My whole life I’ve felt different to others and have missed out on so many opportunities because of various anxieties. It makes me feel terrible about myself. While they are away my day to day life probably won’t be that different because I spend most of my time at work anyway. The last time my husband went away a number of years ago I completely fell apart but this time I’ll have a lot less free time to think about the situation. The key is to keep busy; I will probably spend lots of time on my blog so I don’t get lonely. Also, my photographer will be away so that will make outfit posts less frequent. But hopefully I can convince my sister to take a set of pictures for me this weekend. My sister is coming to stay on the weekend and I really appreciate the company and something to look forward to at a time where I would otherwise feel sad. 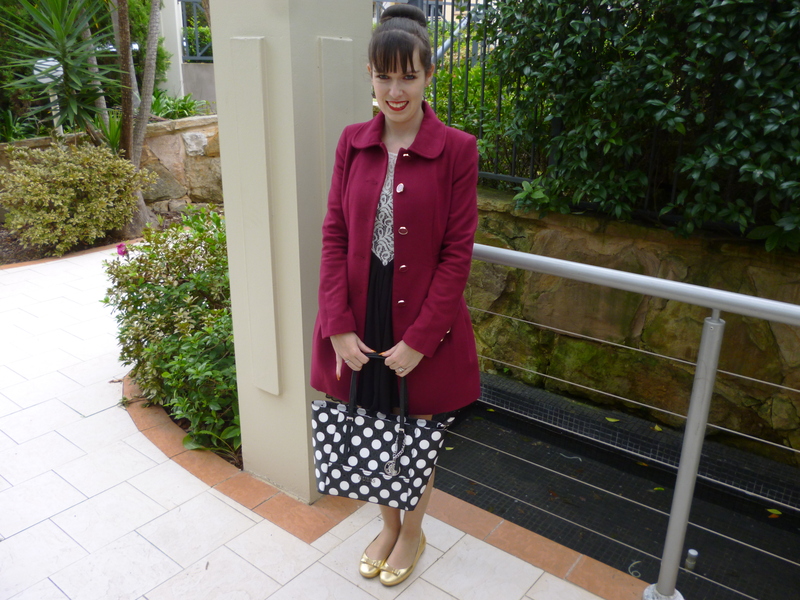 This entry was posted in Dotti, Forever New, Guess, Marc by Marc Jacobs. Bookmark the permalink. In love with your perfect bun! That coat is amazing! Love the color! 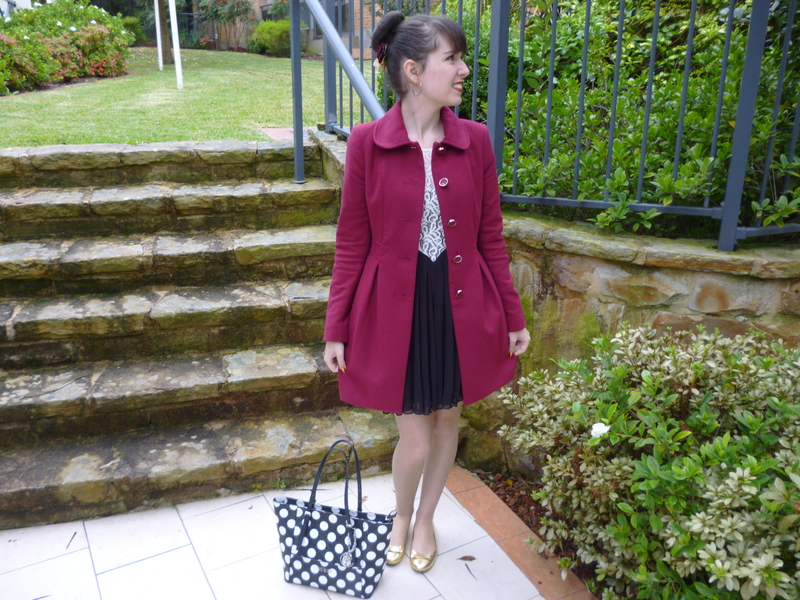 Cute coat, I love that style! And I envy your bun-making skills, haha. 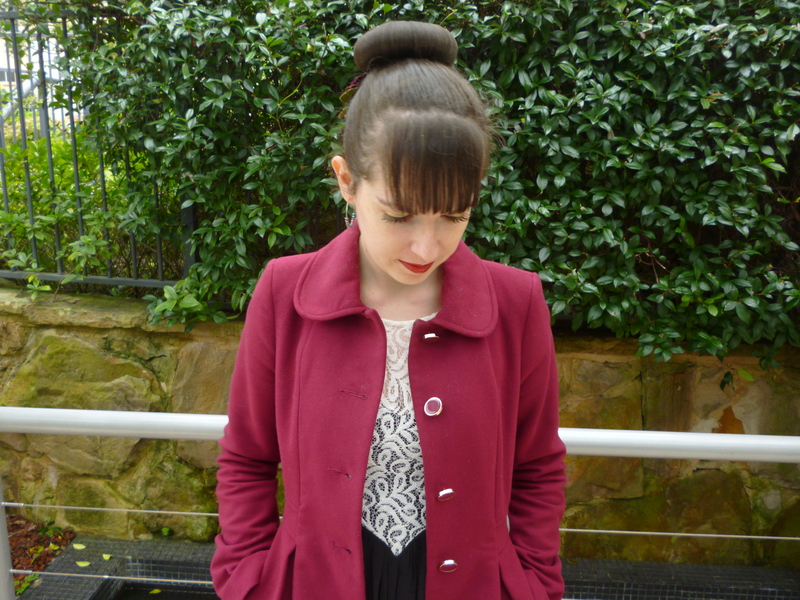 That coat is even more beautiful in this color and so is that hair accessory! I hate it when my man is away, but you're right, the best thing to do is keep busy! Hope these weeks will pass fast for you! Such a pretty coat! Love the flowers in your hair too. It's really sad to hear that you can't join your family in this trip, sometimes life gives us lemons indeed. Hopefully, you will spend your time sensibly too. Regarding your outfit I must say that you look pretty and feminine as always. Your hairdo, lovely hair bun decorated with flowers just wins a special praise! The coat is beautiful and suits you very well! I hope you will be fine while your husband is away! You shouldn't be too hard on yourself, it's understandable that things like flying can make people anxious!